Fusion stone opines that they conduct and run their business with the norms and ethics of a family. (PRLEAP.COM) Fusion stone opines that they conduct and run their business with the norms and ethics of a family. Nothing is more important than family. It is a bond that thrives in the good times and bad. It's a group of people that offer strength when you need it, whether that be a shoulder to cry on, an ear to listen or a smile when you need it most. Family is there to pick you up when you fall, and keep you going when things are going well. All of these principles can be found in the way that they conduct and run their business. Strong foundations and sticking by their customers, no matter what. A family tradition - Fusion Stone is manufactured by Shouldice Designer Stone, who have a deep and proud history. For over 70 years, they have established themselves as true pioneers who are heavily focused on innovation, quality and service. This dedication has allowed them to thrive, while becoming leaders in the stone and veneer industry. They are now in their 3rd generation of 100% Canadian family ownership, and couldn't be prouder of this fact. The company wear it as a badge of honour that they have been able to help Canadians create the home of their dreams for so many years. Style to suit any home. You can't become a viable company for decades based on words alone. Your actions and products need to speak for themselves, and their customer feedback has proven that they've accomplished that. They're always striving for the highest level of customer satisfaction possible. That's why they created Fusion Stone, a patented clip system that is deigned to be installed on any existing wall or surface. This system utilizes stainless steel clips and screws that can be installed in any weather with only a few basic tools. The company designed this system so that it can be installed by people with varying degrees of DIY experience. Their product family includes Great Lakes, Peninsula Ledgestone and Dry-Stack, all distinct and stunning products in their own ways. They come in a variety of colours that are sure to match any home's design style. 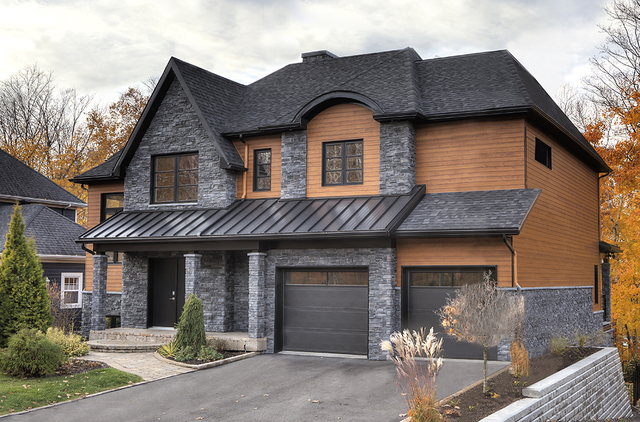 The best-selling Fusion Stone system, Great Lakes is available in a wide variety of colours and styles including Brindle, Raven, Fawn and Carbon. With no mortar required, Great Lakes is mess-free and easy to install, giving a rugged, traditional look to your project. The newest member of the Fusion Stone family, Peninsula Ledgestone was developed to provide a contemporary stone veneer look. This modern choice is available in two colours – Grotto and Cyprus – and like Great Lakes doesn't use mortar. That means that you can get the modern look you're after without the mess using our simple patented DIY clip system. Available in Charcoal or Caramel colours, Dry-Stack offers a mortar-free, no-mess installation option with the benefit of a modern, highly finished appearance. Like Great Lakes and Peninsula Ledgestone, this product is simple to install on the exterior of your home or office, around windows or doors, as wainscoting, and areas where you'll use Dry-Stack to transition from the roof to the wall. It's easy to achieve a beautiful, modern-look for your project with Dry-Stack. A product doesn't mean a whole lot unless you can have complete confidence in it. At Fusion Stone they stand by everything they make, and our lifetime warranty showcases that. Fusion Stone are proud to offer on all of their products, a lifetime of maintenance-free performance. Their lifetime guarantee also promises the structural, aesthetic and performance integrity on all of their products for life. Allow the Fusion Stone family to help yours on your next DIY project. Find a dealer near you today, and let your vision become a reality. Fusion Stone is manufactured by Shouldice Designer Stone that has a rich and proud history of Innovation, Quality and Service. They are an example of the coming together of the beauty, strength, and maintenance free virtues of traditional stone with the ease of installation and affordability of stone veneer. Fusion Stone is an easy and budget-friendly way to beautifully upgrade your home, inside and out.